As any classic car lover can probably tell you, a Lil’ Deuce Coupe is a three window 1932 Ford Coupe with a flathead V8 engine — one of the most desirable hot rods of all time — especially in those high-test, gasoline-drenched days before the Beatles and the shaggy moptop British Invasion when kids with close-cropped crew cuts and a couple of tons of Detroit steel still ruled the world and even the mighty Beach Boys sometimes abandoned their waves and sand and surfer girls sagas for a brilliant, rubber-burning string of muscle car anthems for the masses of youngsters crawling in the driver’s seat above their first set of wheels (just consider “Shut Down,” “Fun, Fun, Fun,” “I Get Around” and “409,” for example). We all can relive those days of heavy metal thunder this Saturday, June 30 as the Lassen County Chamber of Commerce presents the 26th annual Main Cruise Show ‘n’ Shine in Memorial Park. Patti Hagata, executive director of the Lassen County Chamber of Commerce, said more than 50 car owners had already pre-registered to participate in the event, and participants may register on the day of event. 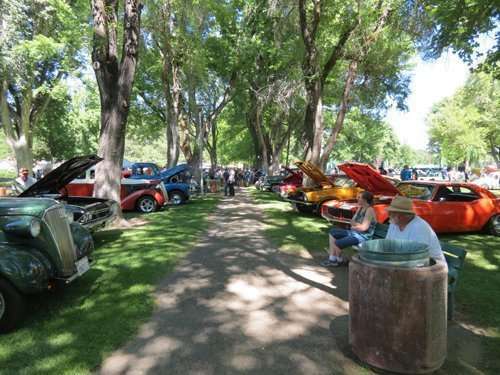 Day of the event registration begins at noon; at 12:30 p.m. cars can begin entering Memorial Park for the Show ‘n’ Shine; at 1 p.m. the car show opens to the public and food and drink vendors also open; at 1:30 p.m. Forgery, one of Susanville’s most popular classic rock bands, begins performing at the band stand; at 5:30 p.m. the car awards are announced; and the event ends at 6 p.m. Nine Miss Lassen County contestants are expected to attend, and the event includes arts and craft vendors as well. For more information, call the Lassen County Chamber of Commerce at 257-4323.